The title of Chapter 1 is based on an extract from a poem called ‘Northern Soul’ by Ron Silliman and it’s displayed in glorious red neon once you alight at the Metrolink station in town. Was it a portent of things to come for your dear author and virtual manager of the third tier outfit? If you need a reminder of the Buryball ‘rules’, look here. 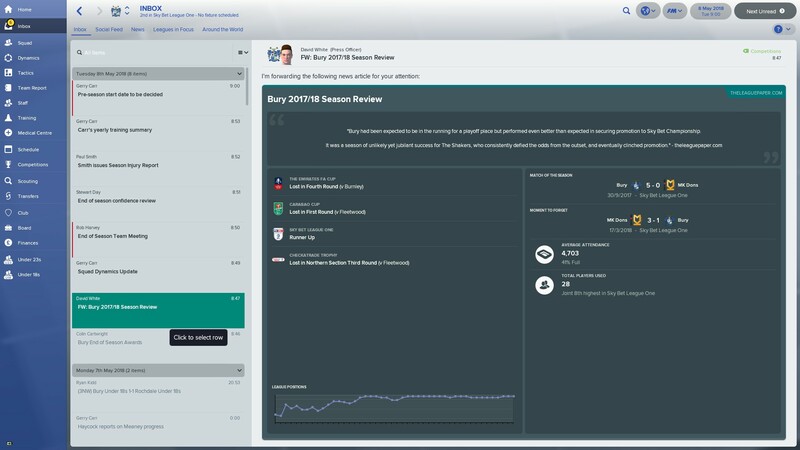 There’s a real divide in how Bury start life on FM18. On the one hand, you are blessed with one of the best squads in League One with some promising youngsters coming through the U18s and the minimum (non-negotiable) expectation set by the board accurately reflects this – nothing less than participation in the play-offs will do. On the other, the club are in massive debt, which needs servicing and has a tendency to eat away at any gate receipts and transfer fees received. 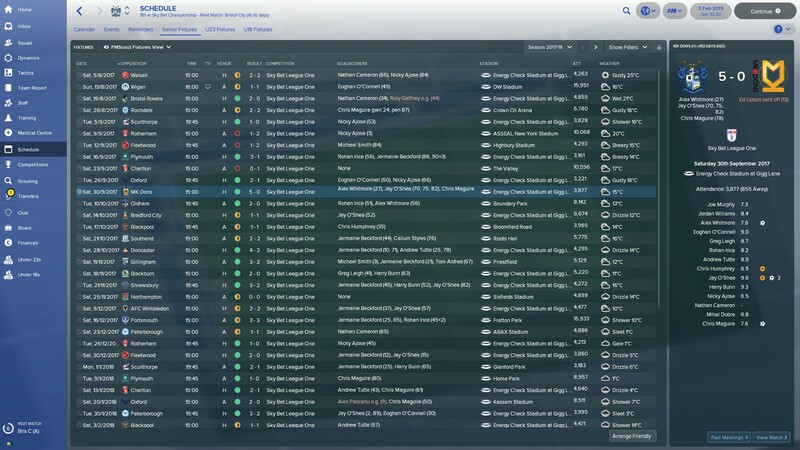 Additionally, the backroom staff are of a poor calibre even by the division’s standards, so, with the summer transfer window disabled, my first act was to negotiate severance deals with the vast majority of them and with the replacements, instill a more collegiate approach to the running of the first team, as is one of the guiding principles of the ‘Moneyball’ mantra. 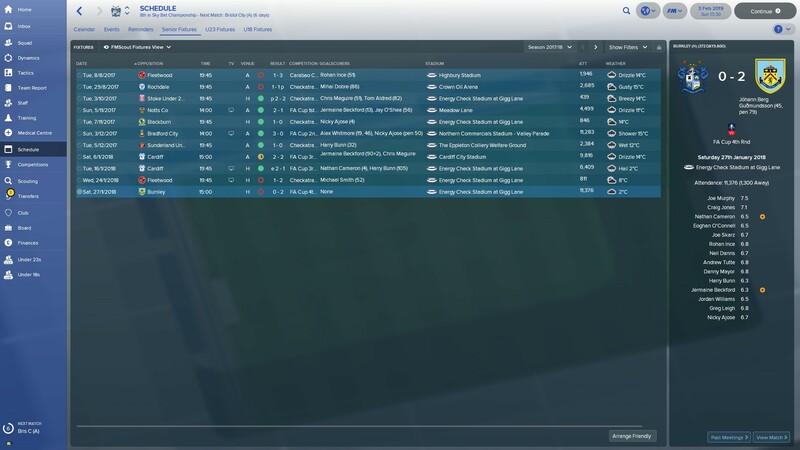 Using the real fixtures allowed me to pit my wits against Lee Clark’s spectacularly poor start… but even he managed to win on opening day against Walsall whereas I conspired to draw 2-2. I did however manage to prevent a hiding by Wigan Athletic in the second league game after the customary first round exit at the hands of Fleetwood Town in the EFL Cup. 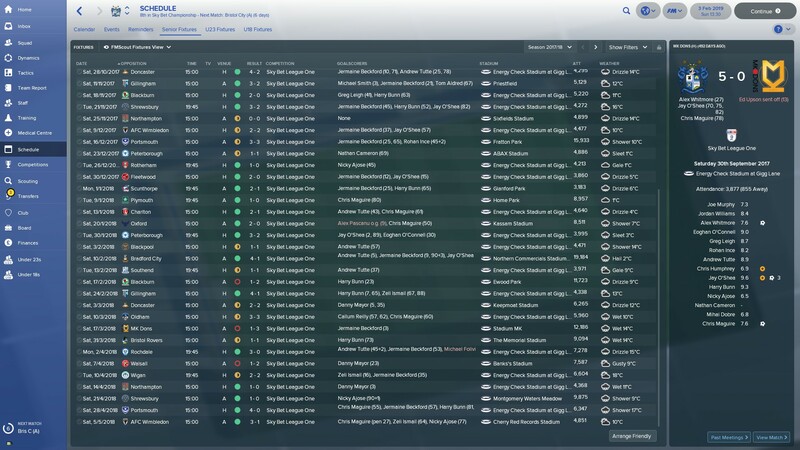 Just as I thought things started to improve in the league (even scoring against Rochdale! ), my side hit the buffers in early September. Uwe Rösler and the Cod Army inflicted another painful defeat in just a month to leave me questioning whether my 4-2-3-1 formation with plenty of individual and team instructions was really the way forward. 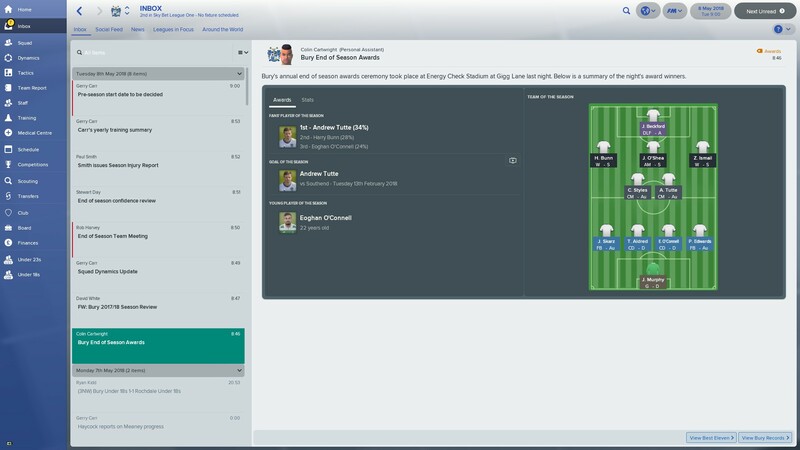 I simplified things to a large degree and only retained certain tasks for the more creative attacking trio in behind Jermaine Beckford… before he got injured. 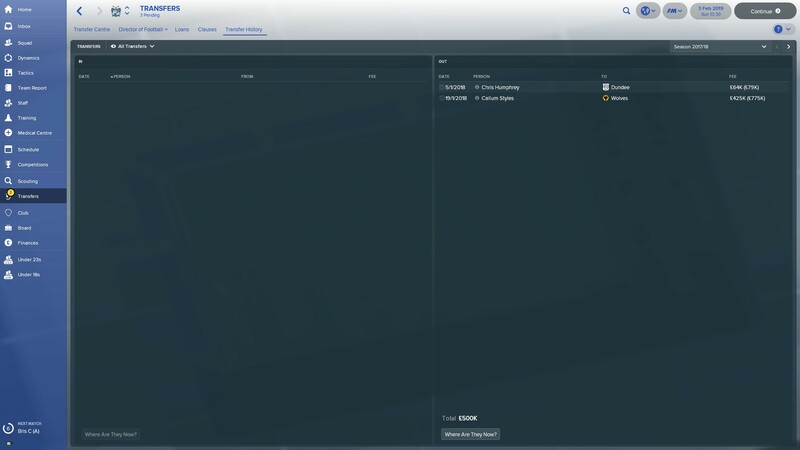 It didn’t provide spectacular results from the get-go but did reach a high point with a 5-0 thwacking of MK Dons, trequartista Jay O’Shea being the chief architect in their downfall with a hat-trick, which he completed in the space of 12 minutes. What followed was a gloriously long unbeaten run in the third tier, the status of which was salvaged three games on the spin in the gruelling early winter period with consecutive score draws. Obviously, I was in not much of a position to say ‘no’ and the rules of ‘Buryball’ would’ve forbidden it as it exceeded his value… but there were more than 20 clubs chasing his signature, so it would’ve been prudent to negotiate a higher initial fee and my protests fell on Stewart Day’s ample but deaf ears. 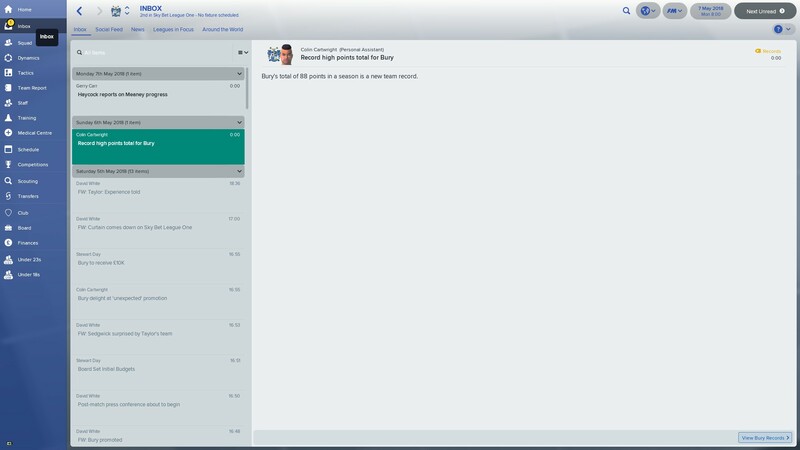 Luckily, the chairman saw fit to at least include a 40% profit on Styles’ next transfer clause but realistically, his replacement would have to come from within for the time being. The fourth round tie was not the money-spinning affair the club yearned for as it was at home to Burnley. Three days prior, Bury had bowed out of the EFL Trophy in the regional quarter-final stage (bloody Fleetwood!) and a repeat of the 1985/1986 jaunt to the fifth round of the much more famous competition sadly didn’t materialise. In a case of art imitating life, runaway leaders Shrewsbury Town were decimating all-comers. 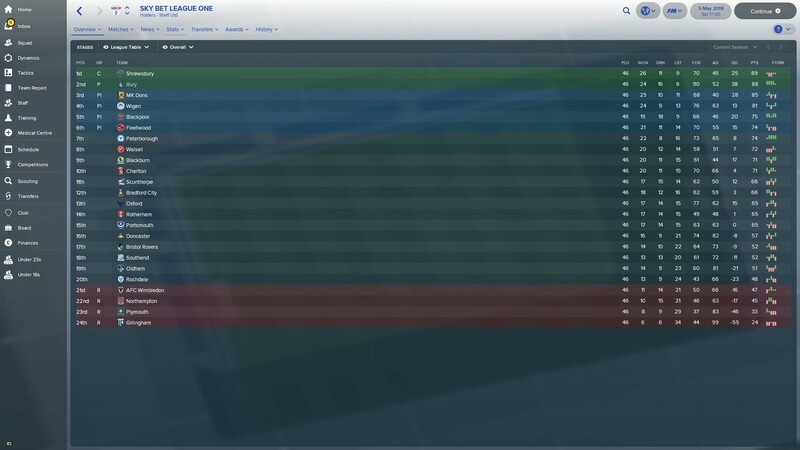 The 24-game unbeaten my side had enjoyed came to an end just before my in-game 32nd birthday at the hands of Blackburn Rovers but even before that, the gap was sizeable between them and the chasing pack. In words I didn’t think I’d ever type, Andrew Tutte’s all-round brilliance in the engine room was the platform to mount a challenge to the side in blue and amber. Zeli Ismail had also returned from his loan spell at Walsall and in Mayor’s second prolonged absence of 2017/2018, he made the right-wing his own. David Flitcroft, eat your heart out! 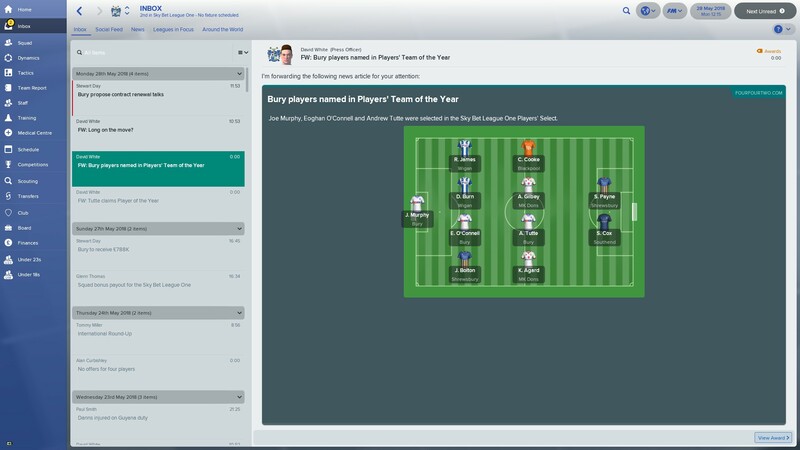 League One Team of the Season 2017/2018 – three Bury players! 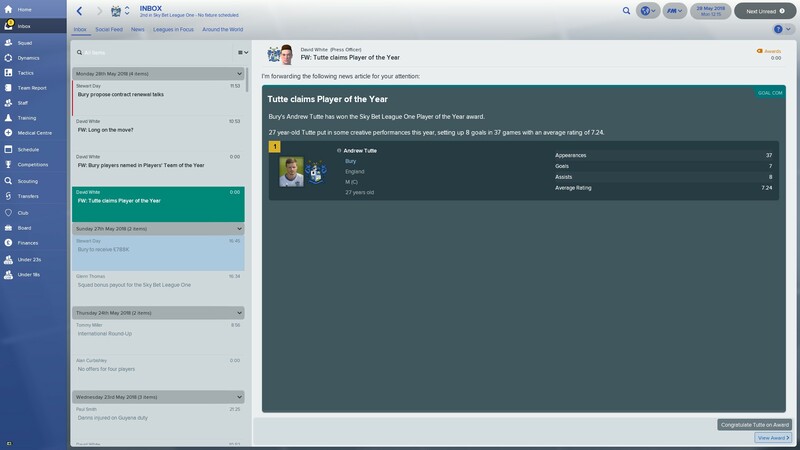 Yes, Andrew Tutte was Player of the Season… for the entire league! Can the Shakers survive as an indebted small fish in the second tier’s big pond? Part 2 will follow soon. In the meantime, if you have comments or ideas of how to improve Buryball, let me know!